Flavia Dzodan is a business developer, writer and public speaker, currently residing in Amsterdam, the Netherlands. 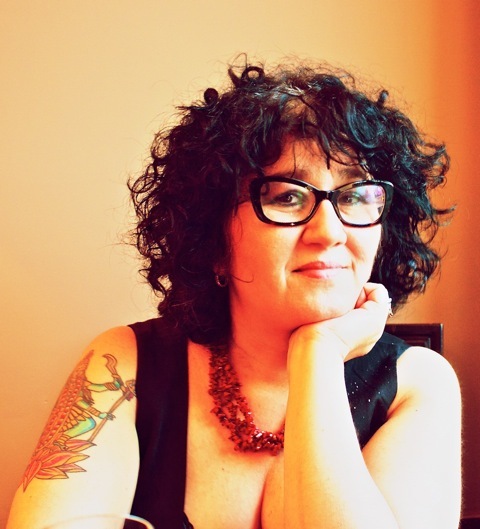 Her writing has been featured in The Guardian’s CIF, xoJane and on Gender Across Borders. She also frequently blogs at Tiger Beatdown and on her own blog Red Light Politics. Her main interest lies in the intersections of race, class and gender in a European context. Flavia was born in Argentina and came to the Netherlands in her twenties, where she has lived ever since. I spoke to her about immigration in Europe, the role of the political parties, and her own experiences and projects. An edited version of this interview was previously published on Gender Across Borders for a series on women and migration. Henrike Dessaules: How did your own experience of coming to Europe influence your writing and activism? Flavia Dzodan: For me the biggest shock was to go from being totally unaware of how certain immigration issues play out in Europe, and then to be here and to be labeled by the state as the “Other”. That was my starting point: to try to understand what was going on. A lot of what I write stems from that need to understand and unpack that structure that we see in place across the entire EU. What I’m interested in is unpacking a system where we have one group of dominant culture, which is white (for all intents and purposes, this is a system of whiteness), and you have a system of “Other”, which is the immigrant, the foreigner, the alien. What is happening in the EU since 2001 is that this “Other” is almost always invariably coded as Muslim. This is nonsense, because immigration is not just Muslim, but in order to actually get away without accusations of racism, they use this code word of immigrant, when actually what they mean is Muslim. HD: Have you noticed a particular change in that over the most recent years? FD: Very much so. I see it escalating. Every election cycle in Europe this escalates and gets worse, with more aggressive rhetoric, with more outlandish ideas of how immigrants should be treated, and there’s also this obscuring of what really goes on. You probably saw what I wrote about the internment camps where immigrants are kept. Well, all of this is obscured in the media. You don’t get to hear that there are these blatant human rights abuses. So, on the one hand the rhetoric increases, and that is the visible aspect, but in the background the policies that make these human rights abuses legitimate are enacted and passed as legislation. Of course, there is an increase. I would say it started around 2001, but it has only gotten progressively worse. And these people have more legitimacy as well. More mainstream legitimacy. What in the nineties would have been unthinkable, for someone like Jean Marie Le Pen, say, or Geert Wilders, now is a matter of daily occurrence in the media. HD: How do you think it plays out in particular in the Netherlands? FD: Well, in the Netherlands we have Geert Wilders. He was one of the pioneers of this movement. He has a genealogy of politicians that came before him, that also peddled his ideas since the late nineties, but he’s the most visible and he was the first across the EU to come up with this rhetoric of hatred and racialized politics. It would be absurd to call him names or to call his supporters names. People usually are very simplistic; they say: ‘These people are dumb and that’s why they follow him.’ That, I’m afraid to say, is very simplistic and not a nuanced analysis. These people have legitimate reasons to feel disenfranchised and to feel left out, and to feel that the system has failed them. Wilders exploits this very legitimate anger by giving them lies. But people are not stupid. It’s not that they believe him because they’re uneducated or they don’t know better. They believe him because for years they haven’t been addressed. Nobody has actually taken the time to listen to what are very legitimate complaints against globalization, against the growth of capitalism, in every sphere of our lives. And how they feel left behind because they cannot consume at the pace that society tells us; that in order to be a full subject, you need to consume: fashion, culture, etc. And his supporters come in general from areas with legitimate poverty indexes, with struggles to find jobs, and that with a model of every-day social life that is no longer what it used to be twenty years ago. HD: Ironically, I’ve read that the supporters of Marine Le Pen, for example, are primarily from the areas that are further outside of the cities, so where actually there are not that many immigrants at all. FD: It’s the same with Wilders, exactly the same. HD: And one argument that always comes up in the immigration debate is this sort of the-boat-is-full rhetoric, that we just can’t have everyone coming. What would you reply to that? FD: I’d say that it’s a very historically flawed way of looking at what has happened between Europe and the global South for the past 500 years. I mean, let’s not forget the very long, painful and brutal history of colonization of Europe in the countries where all these immigrants come from. So you have a continent that, with very few exceptions, went to these countries and ravaged resources, created a system of dependency, created a system of oppression for entire populations, and these have been perpetrated until not so long ago. In the last 50 to 100 years Europe has decolonized. And now they have these populations who have no access to resources, who have no access to funds, and Europe does not take any responsibility in the creation of these systems, so yes, sure, Europe is full. I’m not going to debate that because I’m not a demographer. […] So let’s grant these arguments some validity. Even if that was true, how do we address this system of inequalities that Europe created in the countries where these people come from? We created a welfare system in the EU across the entire continent on the back of the colonized countries. And now, when these people 50 or 100 years later say “Hey, we also deserve a portion of this pie”, we tell them “Oh, but it’s full”. HD: So what do you think would need to happen in the near future? What do you think are the most pressing issues at the moment? FD: I think that the racism in the EU must be addressed. Unless it’s tackled and actually fixed from the root, it’s only going to lead to more problems. I’m not even talking about a comprehensive immigration policy that contemplates all of these issues, which is another necessity. But even before that, I’m talking about something that is urgent and immediate, and that is to address the system of institutionalized racism. I give you another example from the Netherlands: When you look at the statistics of unemployment rates for under 25-year-olds in the Netherlands, for Dutch white natives the rate is at something like 5%. For Moroccan natives under 25 years old, the unemployment rate is at 25%. And for males under 25 of Surinamese origin, which is a former Dutch colony, and it’s mostly an Afro-Caribbean population of mixed heritage, the unemployment rate is at 27%. So when we look at these inequalities, I’m sorry, the only possible explanation is that system of institutionalized racist practices. Unless we address this, unless we tackle the mentality that makes these unemployment statistics possible, I don’t see us fixing anything in the near future. HD: That’s really interesting, that you mention the unemployment rates for young men. I think, usually migrant women tend to suffer less from unemployment, but they are also in more precarious jobs. Do you think that immigration affects women differently from men? FD: Of course I do. Especially in Europe there is this sexualization of the immigrant. The immigrant body is a gendered body. The immigrant woman in her visible difference becomes a threat. And of course, because she is the child-bearer, she’s also the one that’s going to bear the brunt of the racist hatred. She gives birth to these children that are taking over “our” society. She is the one that wears the markers of difference, and that is most visible in the case of the Muslim immigrant woman. She obviously doesn’t look like us, and she doesn’t speak like us. So she becomes this embodied threat that the system presents as someone that needs to be saved constantly. And how do European governments treat the immigrant woman? As someone that needs to be rescued from the perils of her own culture. You have the burka debate, you have the birth rates around immigrant families… There is a whole set of coded “issues”, and I say “issues” with huge quotation marks, that are ascribed to immigrant women specifically. They do have another whole set of real issues, of course, I’m not denying that. But, you know, it’s always the woman who carries the burden, because we have to deal with a white savior complex as well. The burka debate is all code to save these women from themselves. HD: Yes, definitely, and I think that these kinds of arguments are also used more and more these days by the so-called political left, by pandering to ideas about women’s rights and the rights of homosexuals, and by saying that certain immigrant groups reject the ideals of our Western society. Do you think that there is a swing to the left as well with anti-immigrant sentiments? FD: I want to be completely honest with you: My biggest disappointment in European politics comes from the left. My biggest disappointment. Because from the right I come to expect nothing different. I don’t expect them to change the tune of what they have been saying for the past 60 years, you know. […] But the left, I blame the left collectively. And I put myself in this as well. I’m not pointing fingers, as if I’m not part of the system. We all are. We all live in this society. At the beginning, in the late nineties and early 2000s, especially after the World Trade Center debacle, what the left did was at first not pay attention, so as not to legitimate this racist xenophobia, so they dismissed it as a fad, as something that would eventually go away. That silence actually was counter-productive, because they didn’t resist with the emphasis that is required to oppose these ideologies. These ideologies were left to grow and develop and become more nuanced and more legitimate, and eventually when the left reacted to this, it was too late. So now what do we do? The left jumps on that bandwagon, to try to steal voters from the right. We don’t have an emphatic and clear opposition from the left, to people like Wilders, to people like Le Pen, or to the variety of xenophobes. The left opposes in principle the very caricature-like expressions of racism, like the neo-Nazis. They are like cartoon characters. It’s easy to oppose them. Who wouldn’t oppose them? And they are also for me the least dangerous threat, because they are so obvious and so blatant, that we can see them coming. And the left opposes that. I’m sorry, that serves little purpose for a structural change in those unemployment rates, in the mentality, in the institutionalized practices of hiring and human resources. And the left does nothing to oppose all of that with a clear and very strict rhetoric of standing against it. And I’m very, very disappointed. I vote here in the Netherlands, of course, and I struggle every election to find a party that represents me. HD: And after all these years, do you feel like you’re a bit Dutch now, or do you still feel Argentinian? FD: First and foremost, I’m Hispanic and Latina, and my struggle in terms of my immigration status, in terms of my status as “Other”, is the same as everyone’s from Latin America. We have to bear this burden of a racialized system, where we are constantly “Othered”. I am Argentinian, of course I am. That goes without saying, but I also look at what that means pan-regionally. I write about politics, about policies of immigration, and for me the interesting thing is how the EU creates patterns to racialize and to “Other” groups of people. This is not something I have any hand in, but I am coded as Latin American. And I’m fine with that, I mean, that’s what I am, after all. Am I Dutch? No, no. I love this place; this is home, and this where I live. But I’m never going to be Dutch. This has nothing to do with how I feel. When the state hands me my documents, I am a special category. Even if I acquire the Dutch citizenship, I am coded as foreigner and my children, if they are born, they are also foreigners. And this is a state category. This is not something that I choose. I don’t “Other” myself. The state does that for me. It doesn’t matter how I feel. The state tells me I’m not Dutch. So how I feel is irrelevant here. HD: What’s your next big project going to be? FD: Actually, I’m writing a book about anger. Political anger, to be more precise. Because as women and as feminists, especially when you’re not white in a very white environment, anger is a very scary emotion. You are constantly told that anger is not the way to engage politically. I believe this is counter-productive. There is a whole set of women who have come before me, who have written about this, like Audre Lorde or Sara Ahmed, people who are way more knowledgeable than me on this. I’m not pretending that I am original here. What I’m trying to do, is to write about it in a European context. Because a lot of the things that we have are very much American-centric. And I’m fine with that. I believe that this work that all these women have done before us is very useful as a reference, but we don’t have a history of racialized Europeans within feminism. […] European feminism presents itself as pretty much white. Let me rephrase that: non-racialized. Which, you know, means that it’s white by default. That’s a disservice, because that’s not the reality of what we live or what’s going on. And my approach in the book is to write about anger, and anger in relation to this European way of looking at politics and the politics of engagement. HD: Thank you so much.